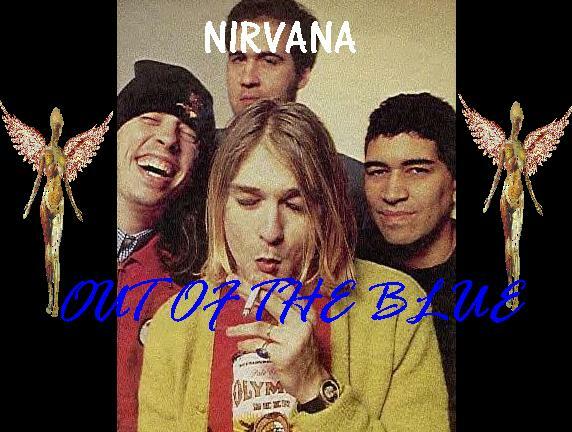 Out of the Blue is a website dedicated to the legendary Seattle grunge band Nirvana and to Kurt Cobain.I decided to make a website on Nirvana because of their influence on me and the rest of the world and because of today's popular music scene. What I'm trying to say is, if Nirvana were around today they wouldn't be playing half the stuff you see on MTV. Anyways,I have a lot of information on Nirvana and Kurt and plan to have more in the future. In this site you will be able to find:my reviews on Nirvana bootlegs, updates on the upcoming major motion picture A Leonard Cohen Afterworld and on the upcoming Nirvana album, the story of Nirvana, Kurt's biography, and a section about me. I also have a few very cool links that you might want to check out when you're done with this site.Last but not least,if you have any questions or comments feel free to e-mail me. This website was created on August 28th, 2000. Last updated on November 1st, 2000.